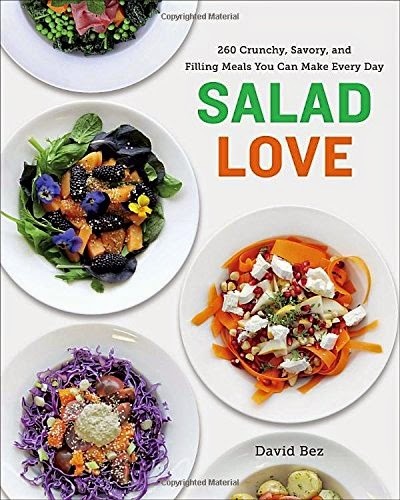 David Bez writes at the beginning of Salad Love that it isn't a cookbook. Instead, this is collection of 260 of the most photogenic salads he made over the course of three years of preparing lunch at his desk as part of his personal goal of eating more vegetables, which eventually gave way to the challenge to document it in a blog called Salad Pride. The recipes in the book, which cater to vegetarian, vegan, pescatarian and omnivorous tastes with an emphasis on crunchy raw produce, are simply lists of ingredients that Bez assembled at his desk. In addition to not being a cookbook--as there’s not a whole lot of cooking going on in the recipes--there’s also not a lot of text in this book. The first 30 pages feature the author’s guidelines for the proportions of produce, proteins, toppings and dressings that make up his ideal salad, the back story of how his personal dietary vision became a blog and then a book, and a cubicle tour of how he was able to prepare all these culinary feats at his desk as office mates salivated in the background. After that, it’s just recipes and one glorious macro photo after the next, arranged by season from summer to spring. Salads for Bez often feature ribbons of purple carrot, heaps of fresh herbs, a scattering of pomegranate seeds, edible flowers and spirals of deli meats made to look like flowers. In short, the book is gorgeous; Bez really takes salad to the level of an art. On the downside, some of the salads were not only too pretty to eat, but I couldn’t imagine enjoying them when I crunched someone of them up with my mind's mouth. Consider the Pear, Dates, Cashews and Endive salad from p 221. The spade-shaped endive leaves are arranged in a star formation, cupping the chunky fruit and nuts, which are topped with a tidy bunch of whole chives. All of this is dressed simply in oil and lemon juice. I can only imagine how cumbersome it would be to eat this and how much chewing would be involved. Many of the recipes had me thinking this way, despite how lovely they were to look at. It's not a deal breaker, as the book contains hundreds of recipes, many of which do strike my fancy. Overall, Salad Love is both inspired and inspiring. For vegetable-loving foodies, there’s plenty of visual fodder for creating a new combination of colors, textures and flavors to excite and delight the taste buds. One final plus to this book: the extensive index makes it easy for someone to find recipes based on a particular dietary restriction or to find dozens of ideas on what might go well with a specific ingredient they have on hand, say, watercress or chive blossoms or pomegranate seeds.